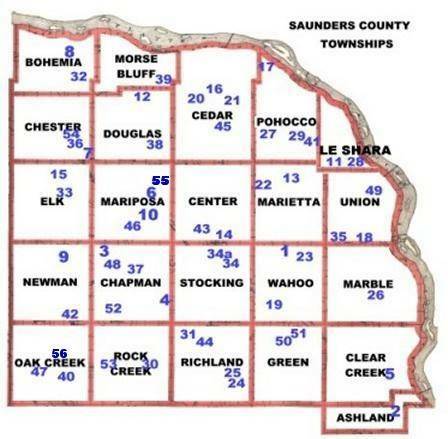 Clarabell Mares has graciously given us permission to post the indexes for the Saunders County cemeteries that we will be adding as they are transcribed. She and other volunteers have spent a lot of time walking and recording the tombstone records for each of these cemeteries, and we want to give them all a special "Thank-you". Claire has also given us permission to post the photos that she took of the cemeteries when they were indexed. Renee Bunck has spent a lot of time scanning them in for us, plus making copies of the indexes and sending them to us. Guy Podgornik, Geri DeGroff, Roma Black and Karen Steele have all been either taking pictures of the cemeteries or working on getting updated information. Thank you to all of the great volunteers! Many of these cemeteries have more than one name. We will make an effort to give those names if we know them. If you know of other names for these cemeteries, please contact us. There are a few small cemeteries that have no names, and these will be added to the list as we get them prepared for the web. If you have any information on these cemeteries, please contact Connie Snyder at: cjsnyder@kc.rr.com. I've tried to put the name of the township where each cemetery is located as it is posted. The map below has approximate locations for the cemeteries. We do not have an exact location yet for all of them. The indexes listed under Family Plots are not on the map. The numbers on the map correspond to the numbers on the table below. Cemetery location maps have been added to most indexes. Can you help to verify their accuracy? Non-NEGenWeb Project site Index available. Located in USGenWeb Tombstone Project.